There I was, one of just a few women in a large conference room filled with men. It was an experience I’ve had many times before in my life. Yet instead of the usual narrative that often plays itself out in this dynamic, this time it was different. This time it was better. I was at the Better Man Conference. 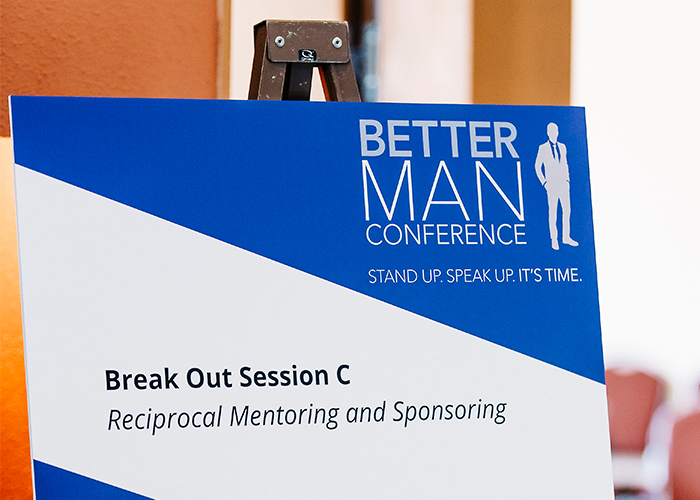 The Better Man Conference is a one-day event with resources, support, and community to engage men as allies in creating an inclusive culture. I was there to speak about Reciprocal Mentoring at two of the break-out sessions. I was surprised to find out that as the conference began, these men weren’t joking around. 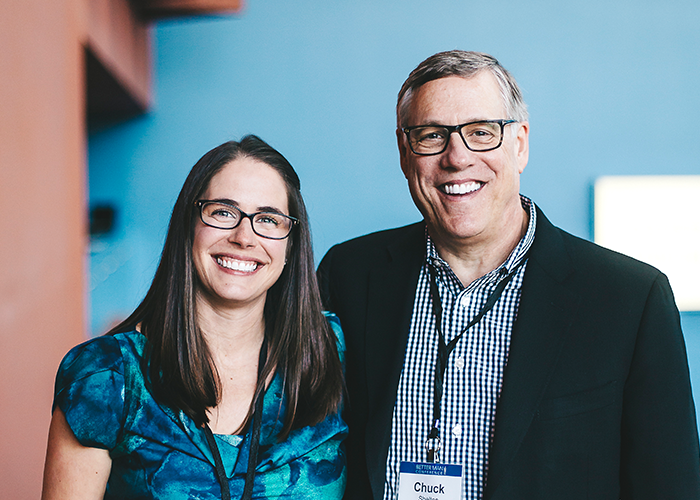 The themes throughout the conference could be called “counter cultural,” yet they were just what this culture needs. There was honest dialogue about vulnerability and questioning the strict traditional constructs of what it means to be a man. There were challenging conversations about the privilege that comes with being a man that were specifically called out. Many of the presenters did not pull any punches. I cannot speak to the experience of all the people (both men and women) in the room. But what struck me in particular was that men (presenters and audience members) were showing up and actually doing the hard, uncomfortable, fabulous, and challenging work of becoming better themselves so they could be better for their diverse colleagues. I was watching the transformative power that is inherent in approaching a normative culture with grace, openness, honesty, and truth, in a challenging but safe space. In the time of #MeToo and #TimesUp, where (rightfully) we are bombarded with all the examples of what men are doing wrong, it was so incredibly wonderful to watch a group of men doing the work of what is right. I watched a professional white man openly talk about vulnerability as a strength. And I watched the men in the room really listen. I heard men openly admitting how hard it feels for them to “take the risk” of stepping into a more active role in inclusion at work. And I watched those same men stay and not bail on the discomfort of growth when it was called out to them (by other men) that the fact that they have a choice to take an active role in inclusion work at all is a direct sign of their privilege and why they must. Men discussed the honest truth that women and people of color (and anyone in a non-normative group) do not get to choose if they want to play a role in inclusion work, but instead must live within the confines of a society built for white men. It was fascinating to watch men engage with other men in a generative way! I heard honest discussions on privilege (in all its forms) and what the ramifications of that privilege can be. I heard people owning their privilege in ways that were new and moved them past the fear that can keep people from starting the conversations at all. I watched as the founder of the event, Ray Arata, acknowledged that much of the discussions of the day centered around gender as being ‘man’ and ‘woman,’ when in fact gender is non-binary and there are ramifications to that reality for how we lead inclusively. During the two break-out sessions we led on Reciprocal Mentoring, I watched men lean in, eager to learn practical tools on how to develop their own personal skill set around inclusion. They wanted to make inclusion real for them. They were trying out what it meant to develop a point of view on gender, on what it means to be a man in the workplace (and in life), and how they could be better. It was inspiring. Time and time again men were able to express thoughts and worries, that when received in a safe space free of judgement, allowed them to be guided out of misconceptions and pushed to better places. This is what can happen when men who want to be a part of the solution are given safe spaces to have conversations that are uncomfortable for them. They were trying out what it meant to develop a point of view on gender, on what it means to be a man in the workplace (and in life), and how they could be better. I had the privilege of speaking with a man in the morning who had never really thought about inclusion before but came because his wife told him she thought it was a good idea. When I saw him again at the end of the event, he spoke genuinely about issues of parental leave and what he could do better to mentor and sponsor women and people who work around him who may feel excluded. And he said these things while acknowledging that he didn’t know it all! He wasn’t thinking about diversity and inclusion as some box to be checked or viewing himself as some white knight to come help the women or “non-normative” people around him. He had a genuine desire to become better himself. And man (pun intended) that was awesome! It made me wonder if, in our professional work of inclusion, we are missing a powerful opportunity to change the issues around inclusion and diversity when we fail to engage privileged men and to invite them to enter into the discussion in safe spaces. At Greatheart Consulting, we have seen the transformative power that can happen when executive men are given space to do their own work around inclusion. My experience at the Better Man Conference reinforced the importance of this. I’m pretty well known for being an optimist. But I’d be lying if I didn’t say that the past few months (or years) have challenged my hope and belief in the good of the world, and of men in particular. I know that talking about how to engage men, especially white men, can sometimes cause a knee jerk reaction from people working so hard every day on diversity, equity and inclusion. In a professional setting, people are often working within tight budgets with seemingly impossible goals. Why should the men get the resources to do the work they should have already done and/or be doing on their own? These are valid questions. However, I can tell you that after spending time watching men, and in particular white men, honestly and authentically start or continue their journeys on how they themselves can be part of the solution, I think there’s a pretty solid argument for expanding budgets aimed at diversity and inclusion to actually include everyone in ways that make sense for them! It shouldn’t be an either/or. Real change comes from both/and. Engaging men in a generative way is both practical — men continue to dominate the business leadership world — and an inherently powerful way to expand the bridge building nature of the inclusion work that we must continue to do. As I was on the plane ride home, I was struck with a thought that hadn’t occurred to me before. I attended the conference to speak to men about the power of reciprocity, about the exchange of value to the benefit of us all. I showed up that morning thinking I would be imparting my small piece of wisdom, advice, and guidance to the men I would meet. But as is always the case with reciprocity, I find now that I benefited from their bravery to be honest and open, their courage to enter the discomfort of authentic growth and not let the it stop them from becoming better. It called out the work I know I need to continue to do regarding my own privilege within the context of the world.